This is an exclusive event and you must click "Going" to ENTER THE TECH! This is the year you will feel the excitement of a new generation and city discovering our music for the first time.. as we take hold of it, twist it, and then loop it.. making House & Techno sound refreshing and exciting at new venues throughout San Diego. The bar will have $1 (ONE DOLLAR) beers from 8 - 9pm, so get there early! This year we wanted to do something special in the spirit of gifting and come together as a community to help the children of Radys Children's Hospital. Many of these children sadly don't get the opportunity to have a typical Christmas. We know that with the help of our generous community, we can collectively work to add joy to the holidays for these children. This can include but is not limited to packaged teething toys, rattles, Discover & Play musical toys and Baby Einstein items. Can't Make The Event But Still Want to Contribute? Serenity Sound System Turbosound low end sound reinforcement provided by the Serenity Sound Systems	. CUE is coming back at you again with another free event at our favorite local brewery! Join us at Ebullition for another day of thick vibes, delicious beers, and friendly faces. 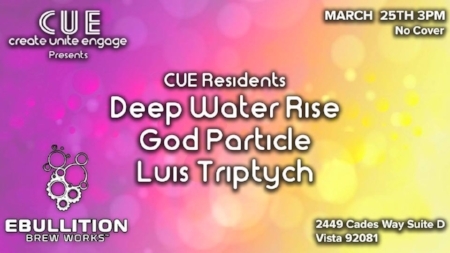 This time we are bringing in Collin Vaz aka Cole Vassallo a resident of United by Bass one of San Diego's premiere house music crews not to mention all around rad dude. For this event we will be supporting Young Producers Group by donating $1 for every new person who signs up for our email list. "Young Producers Group’s mission is to get kids making the music they love in ultra-affordable programs at schools, non-profits, and in studios around the world. With kids from different socioeconomic backgrounds all interested in making electronic music, we aim to use electronic music like Hip Hop and Techno as tools for young people to use to connect across the lines that usually separate them. Collaboration and musical development become vehicles for personal and social growth with YPG. YPG provides a creative community for youth at all skill levels and from all different backgrounds. In-school, after-school, and summer programs connect kids across Los Angeles through the exploration of audio production, beat making, recording, and electronic music performance. With Ableton Live music software as the engine of this exploration, we're helping kids discover the joy of making music. YPG is showing the youth of Los Angeles how to make electronic music and, in turn, the young people are showing the world how creative any of them can be when given the proper opportunities to flourish." CUE is gearing up for another return back to our favorite new brewery in Vista, Ebullition Brew Works, and we couldn't be more excited! This time we will be sharing the stage with an old friend who brings non-stop energy to the dance floor, Drastik Park. We'd be honored if you joined us on May 19th for a free event at one of the coolest new breweries in San Diego! A collective in Tijuana, Mexico that takes unwanted produce from stores and turns it into food for the people! They recently provided an amazing amount of support to the Central American refugee caravan as they awaited processing at the El Chaparral port of entry. In addition to feeding and clothing the caravan and other migrants that arrived in TJ, they are providing medical and legal services in their space at Enclave Caracol. Many migrants come to Tijuana in search of better opportunities- many are also refugees fleeing from extreme violence and political instability. Additionally, they are providing a safe space for the many migrant LGBTQ+ youth in the caravan. Consider supporting and helping out an amazing collective dedicated to helping others! The CUE crew is joining forces with Ebullition Brew Works LLC for a Sunday Funday in North County. We a very excited to make our return back to Vista our home turf for a free event in collaboration with the owners of a brewery we have ton of respect for. Join us March 25th as we bring those feel good day time vibes and enjoy yourself a pint or two of some delicious craft brew. 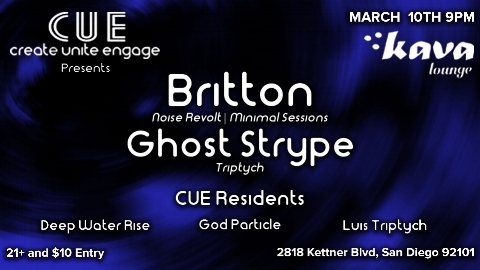 Britton (Noise Revolt, Minimal Sessions) and Ghost Strype (Triptych) both heavy hitters in the local techno scene will be joining up with CUE for a night which is sure to be a blast back at Kava Lounge on March 10th! The CUE Residents will be warming up the night and we will have some serious sound reinforcement compliments of Astral Audio! If that wasn't good enough reason to come, we will be donating a portion of proceeds to a charity which we will be announcing in the next few days on this page!